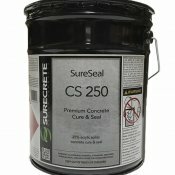 Concrete water-base sealer - modified acrylic co-polymer emulsion that doubles as a membrane forming curing compound and a long-lasting sealer, especially formulated for architectural applications. Concrete Water-BaseSealer quickly dries to a semi-gloss, non-yellowing and durable barrier against moisture, oil and most stains. Concrete Water-Base Sealer is a milky white liquid that sprays on blue and dries clear on any horizontal concrete surface. Its non-clouding formula makes it especially suitable for use on architectural, colored, sand blasted or exposed aggregate concrete. Water-Based Clear Epoxy Coat 2 Gal kit	Primer and Sealer for Interior ConcreteDK 600WB is a two-comp..